Ask fellow campers about "Sunset (NPS Campground)" and nearby attractions. Great value. Multiple restrooms that are very clean. Some sinks available for washing dishes. Outside faucets for filling water jugs. Dumpsters onsite. Only way to improve this place would be showers but with the scarcity of water I can see why there are none. Very nice view of Death Valley. We camped at Sunset (NPS Campground) in a Motorhome. Furnace Creek visitor center has a gift shop. There is a gas station next to the park but is way over priced. Was $4.89 when I was here. Golf course nearby and restaurant neither of which I visited. Plenty of room for all rigs big and small. This is a no hookups campground but it does have bathrooms and a dump station on site. We have solar power for the rig so it works fine for us. Great value for exploring Death Valley NP. Sunset is a large open gravel parking lot with many sites marked off. Plenty of room to spread out so you're not packed in together. Easy to navigate for big rigs. Most are pull through sites. Camp hosts are on site. Very little cell service here. We camped at Sunset (NPS Campground) in a Fifth Wheel. Price reflects using our 62+ National Park Pass. Without this pass price is just $14. This is a very large paved campground right in the middle of Death Valley National Park. Considering the price, that the campground is well supervised, has a dump site, has water, but no hookups, beautiful views, it is a solid 10 to me. No reservations here but we came at high season and did not need them. There are camp hosts. The campground is supervised. Pets are welcome. Very good dump station on site. Water is available in unthreaded faucets at each rest room, but potable water with a threaded faucet is available just past the dump site. We camped at Sunset (NPS Campground) in a Motorhome. Death Valley National Park is a gem of a place to visit. My preference is to visit when it is not too hot. We went in March and had sun, clouds, rain, and just all around great weather. There were some crowds at the points of interest in this huge park but not too bad. We have a Jeep and found that as soon as you get off the pavement the crowd thins to near zero. When we got on the actual 4WD track our two vehicles were the only ones around. It's very nice for a parking lot. We love that we can always go to Death Valley and not have to worry about having a reservation. We stayed in the main part of the campground over Presidents Day Weekend. Got there Saturday mid-day and had lots of open spots. They had to open up the overflow late Saturday, but only had about six sites were used. Walking distance to the visitor center and the bike path to the Borax Works is a fun place for a morning run. We camped at Sunset (NPS Campground) in a Motorhome. This is a great campground in Furnace Creek for dry camping. Location is superb and central to the main sights in Death Valley. It's a large gravel parking lot but it's fairly level and clean. Easy to navigate for big rigs. They have GREAT camp hosts as well. Dump station with water on site. No Verizon signal but Extended 3G. Data throughput is poor. Sporadic internet connectivity. We camped at Sunset (NPS Campground) in a Motorhome. If you are a self contained big rig then this is the deal of the century. True, it is a gravel parking lot, but it is centrally located for all DV sights. We were there mid week early April (shortly before it closes for the season) and maybe 30 of the 270 sights were occupied. Views of the surrounding mountains were awesome. No shade, no grass, no picnic tables, no fire pits. Generator hours 7am - 9 pm are enforced. We camped at Sunset (NPS Campground) in a Motorhome. Paved roads, gravel sites. Really just a big parking lot but close to Furnace Creek and other nearby sites. It was only March 19 and already 99 degrees. Pull through sites provided easy access. Would try upper Texas Spring cmpgr. which is on the same access road but a much nicer layout next time. We camped at Sunset (NPS Campground) in a Travel Trailer. Painter's Palette, Devil's Cornfield, Rhyolite, Borax Works. The rate reflects 50% discount with a Senior Pass. There is really no other way to describe this campground other than as a large parking lot with some spectacular views. It is one of three campgrounds in the Furnace Creek area of Death Valley. Furnace Creek CG takes reservations and is almost always full during prime season. Texas Springs is a no-generator CG and only suitable for tenting or small rigs. During our visit, even though it was a holiday period, the campground was less than 10% full, so we had only one close neighbor. The generator hours are quiet generous from 7 a.m. to 9 p.m. There are restrooms and a dump station in the campground. We had a very strong 3g signal on our Verizon phones and MiFi. No problem with voice, but internet was only sufficient to get a few emails. The adjacent Furnace Creek Ranch, with lodging, restaurants, and store has WiFi for a fee; we did not use it as it is very expensive. Satellite is not a problem since there are no trees. We camped at Sunset (NPS Campground) in a Motorhome. There is no lack of things to do in Death Valley! We were happy to secure a site with the mobs of touristas in DV for the Super Bloom. This was a bit primitive but worked fine for one night. Once again we met interesting people including a guy from Norway. The next night we moved to Texas Springs nearby. It was a Thursday so not so crowded but we saw lots more campers the next 2 days. Bathrooms were nearby, clean, and never a line outside. Too windy for campfire so no ring wasn't a problem. and probably no room for a picnic table. It was what it was, for $6 a night on senior pass. We camped at Sunset (NPS Campground) in a Motorhome. Across from visitors' center and general store plus gas and propane which we needed for dry camping. Also 2 dump stations nearby. We've been to Death Valley several times but had never stayed at this campground, which can hardly be called a campground at all as it's just a huge gravel parking lot with spaces marked off with white paint. There are three advantages to this campground however. First, it's cheap, especially if you have the Americal the Beautiful Pass. Second, it's right in the center of the park across the street from the Visitor Center and the Furnace Creek Resort with its restaurants and general store. And third, there is always room to camp here if all the other campgrounds are full. We came to see the Super Bloom and the park was extremely crowded. We dry camped for five days and on the weekend of our stay the park even opened three additional overflow areas at this campground to accommodate more people! In spite of the no frills atmosphere, this is a fine place to camp. There are three restroom facilities with flush toilets and sinks, but no showers. Considering how crowded the campground was they were kept remarkably clean. Generators are allowed from 7:00 AM to 9:00 PM I believe. Thankfully most people used their generators sparingly so the general mood was quiet and peaceful. There are no picnic tables or fire rings at your "site" but there is one communal fire pit that some folks used a few times while we were there. Two dump stations with potable water are right close by too. Surprisingly, we had a really strong signal on our AT&T cell phone here too. A welcome improvement from the days when we had to drive to Beatty, Nevada to make a phone call! We camped at Sunset (NPS Campground) in a Travel Trailer. The store at the Furnace Creek Resort is expensive but we gladly parted with our money for ice, coffee and ice cream treats! I've heard you can pay $5 to get a pass to use the resort's showers and swimming pool, but we didn't inquire. Gas at Furnace Creek is more expensive than at Stovepipe Wells so plan your trips accordingly. DV is a BIG park. Centrally located from all major attractions and right across the street from the Visitors center. Lots of pull thru sites. We arrived at 9pm and easily found a site even though they were 3/4th full. Site number can be found on a post inside spot. Must pay with credit/debit card and then attach printed slip to post and have either National Park pass or paid slip on dash. Sites are very close together. I estimated 10 feet between our rig and the one next to us. Generator hours from 9-9. Lots of trash bins at each end of the campground. Water is available by hand pump for tent campers or you can fill and dump for free by turning right onto main road and dump and fill site is on the right about .2 miles. Lots of clean bathrooms, but no soap or towels - 3 stalls inc. 1 handicap. On Verizon network but mostly had no signal. We camped in a 35' 5th wheel. We camped at Sunset (NPS Campground) in a Fifth Wheel. Payment is via electronic machine with stub attached to post and checks by campground host. Sites are side by each with white demarcation lines. Generator hours are 9-9 which is terribly annoying when some believe it to be their right to run them for 12 hours. Drinking water stations to fill jugs. Recycling bin next to trash bin. Tent campers best stake down your tents. Thirty mile per hour desert windstorm will make a kite of your tent in a matter of minutes. We camped at Sunset (NPS Campground) in a Motorhome. Fuel up before entering park as prices are at minimum $1.50 more per gallon. This is an overflow lot for NPS but compared to the paid private campground we tried across the street, we preferred this one (and for $5 you can get a pool and shower pass for across the street). 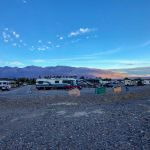 Campground is centrally located in Furnace Creek which was an ideal location for all of the NP. Campground hosts were always walking around and place was clean and quiet. All gravel. For the money we paid we thought it was easy and good value. We would stay again. We camped at Sunset (NPS Campground) in a Motorhome. Gravel parking lot with mostly level sites. Our favorite choice for this area of Death valley. Mostly quiet here although we parked close to the gas station which receives 'noisy' fuel deliveries at 5:30 a.m. Great golf course right across the street too. We camped at Sunset (NPS Campground) in a Fifth Wheel. The rate reflects a 50% discount with a Senior Pass. This campground is basically a large parking lot in the desert. The only reason that it gets a high rating is because it is in beautiful Death Valley National Park. 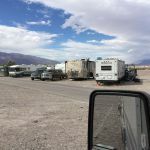 It is just across the street from Furnace Creek campground, which is a little nicer with some trees and picnic tables at each site. Sunset does not take reservations. There is a dump station and fresh drinking water. There is also a restroom with flush toilets, but there are no showers. The campground is open from October through April. Satellite is not a problem since there are no trees. We were surprised that our Verizon phone worked; there is a cell tower at Furnace Creek. However, our Verizon data card did not work. The Visitor Center is a short walk away, and there are restaurants and a small (very expensive) store. There is also a gas station with very expensive gasoline and propane. Since we love Death Valley, we would definitely stay here again. We camped at Sunset (NPS Campground) in a Motorhome. Are you affiliated with Sunset (NPS Campground) ?